If you are experiencing missing teeth, failing teeth, or chronic dental problems, there may be several options for you to get a healthy smile back. For missing teeth, however, only one will give you the comfort and security that offers all the fit, feel, and function of your natural teeth – Dental Implants! First: The implant is placed into the jaw bone to serve as the root for the new tooth. Implants are typically made of medical-grade titanium, the same metal used in many joint replacements. 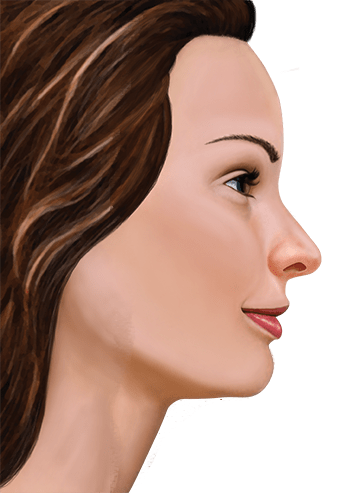 Second: Once it is determined that the implant is firmly joined to the bone, an element is attached to the implant that extends through the soft tissue. This element is called the abutment and will support the new, replaced tooth. Third: A crown (or cap) is made that will restore function and esthetics for the patient. The crown is fabricated with a highly durable material that will look and feel like the natural tooth it is replacing. Dental implants have been recognized as the most significant dental innovation of our generation. Our bone actually grows and attaches itself to the medical-grade titanium which results in a replacement tooth that looks and feels completely natural. Dental implants also preserve your jawbone, which becomes vulnerable to shrinkage over time once teeth are lost. Dental implants are small titanium post placed in the bone beneath the gums, where they serve as a replacement tooth roots. Titanium is osteophilic, which means it loves the bone; bone cells will actually attach and integrate with it. The body of the implant includes ridges or threads like a wood screw that also help it anchor to the bone. 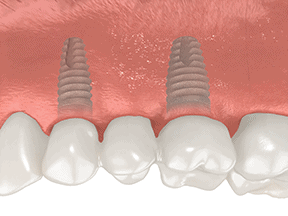 Dental implants provide immovable support for the natural-looking replacement teeth that are attached to them. 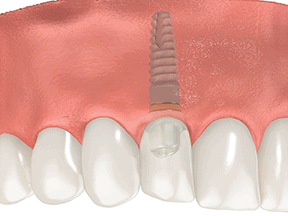 Dental implants are small titanium posts that replace the roots of the missing tooth or teeth. The implant screw is implanted into your jawbone during a minor surgical procedure which will take place here in the dental office. After healing, a natural-looking crown is attached. In some cases, specifically for front teeth, you can have a new, temporary tooth the same day your implant is placed! You could replace one single tooth up to every tooth in your mouth, however you don’t need one dental implant for every missing tooth. Often, there are as few as four to six implants to provide support for a full, replacement set of upper and lower teeth. 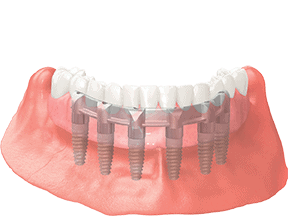 Why consider a Dental Implant over another option? Dental implants are the gold standard in modern dentistry for tooth-replacement, whether you need one tooth or a full set of new teeth. A decades-long track record has proven dental implants to be the longest-lasting, most natural-looking, and best-functioning substitute for natural teeth. Dental implants have a lifetime success rate above 95%, which is the highest of any tooth replacement option. By contrast, for example, the average replacement period for dental bridgework is 7-13 years. Dental implants also help maintain the health of the jawbone. Recent studies have shown that they do this by preventing the bone loss that normally occurs when even one tooth is lost. Removable dentures or partial dentures, on the other hand, actually accelerate jaw bone loss. Many benefits of dental implants stem from the fact that bone cells in the jaw securely attach to the implant. This means that you do not feel slippage or other movement that does occur with removable dentures, and you are better able to continue eating the foods you really like. Furthermore, unlike other tooth replacement options, dental implants are not at all attached to the surrounding teeth which means that you will not be damaging other teeth. Replacement teeth supported by dental implants are also much less likely to need repair or replacement. Typically people may find dental implant procedures very easy to tolerate. Usually post-operative discomfort can be managed with over-the-counter pain relievers such as ibuprofen and tylenol. Implants may seem more expensive than any other tooth-replacement methods such as dentures or bridgework. Implants are often the most cost-effective option since implants are the closest thing to real teeth and also last longer. Only your dentist can decide if you are a candidate after a complete oral examination that includes x-rays of your jaw. Call us at 812-273-2388 to schedule a consultation today to begin the exciting process of restoring your smile with dental implants. Dental implants can replace from one to several teeth, even a full arch of missing teeth, in a variety of ways. When you have lost just one tooth, a single implant is inserted into the bone to replace the root part of that tooth; a natural-looking crown then goes on top. A dental implant stays securely anchored in your jaw, giving you a replacement tooth that looks, feels, and functions like a natural tooth. 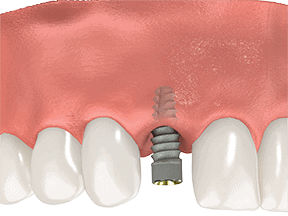 A dental implant is almost always the best replacement for single missing teeth since both partial dentures and fixed bridgework must hook onto existing teeth; this may cause damage or loosening of those surrounding teeth. When more than one tooth is missing, you may not need an implant for each one of them. Instead, implant teeth can act as supports for fixed bridgework. For example, if you are missing three teeth in a row, Dr.Lee can place two implants, one on either side of the gap, and a crown in between that has no implant underneath. Implants can anchor a full set of natural-looking replacement teeth that are never removed, or they can secure a removable denture to make it more stable. This is called an overdenture, which is more comfortable, effective, and healthier to wear than a traditional denture. Some overdentures can be secured with as few as two to four dental implants which will prevent it from slipping while you eat and speak. Furthermore, tradition dentures place pressure on the underlying bone causing more rapid destruction and loss of the jaw. Having implants for an overdenture actually supports the bone and decreases the rate of bone loss. No matter how many teeth you need to replace, there are numerous scientific studies demonstrating the ways dental implants surpass other tooth-replacement methods. In general, these fall into two categories; what dental implants do, and what they do not do. Unlike natural-tooth-supported bridgework, dental implants do not require adjacent healthy teeth to be filed down. Implants do not lead to an increased risk of gum disease, tooth decay, or need for a root canal. Research shows these can all be issues with a traditional bridge that is supported by filed-down natural teeth. Furthermore, studies have shown that bridges may have a failure rate as high as 10% in just 3 years (and up to 30% in 10 years). Dental implants have been shown in studies to have a long term success rate of over 95%. Unlike removable dentures, implants will not shift or feel uncomfortable. They do not develop odors or need special cleaners and adhesives. They do not restrict what foods you can eat or make you feel uncomfortable about chewing, speaking, or smiling. And, you will never have to worry about them slipping or falling out. One of the biggest benefits of dental implants is that they can help reduce bone loss in the jaw. The natural erosion of bone begins as soon as a tooth is lost-and, as more tooth loss occurs, may result in the loss of other teeth leading to a sunken, prematurely aged look in one’s facial features, Because dental implants integrate with bone, they provide a stimulus that keeps the jaw-bone from deteriorating. This helps to maintain a more youthful facial structure and better oral health. Another benefit of implants is the lasting value they offer. While there are other options for tooth replacement that may cost less initially, an investment in dental implants provides benefits that truly endure. With proper care, they can last for the rest of your life. Dental implants are considered today’s gold standard for tooth replacement. You own bone can solidly attach to them and they can’t have tooth decay. Therefore, they last longer than any other tooth-replacement option. Implants also help preserve tooth-supporting bone that deteriorates when a tooth is lost. The surgical procedure used to place an implant is topped with a lifelike crown custom-made to match your existing natural teeth. Implants have a documented success rate of over 95%, which is significantly higher than other tooth-replacement options. Dental bridgework has been used to replace missing teeth for almost a century. 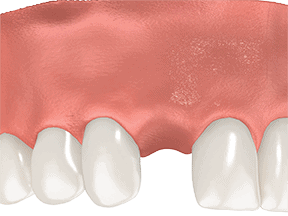 A three-unit fixed bridge requires filing down and placing dental crowns on two teeth-one on either side of a gap left by a missing tooth-and then using those now compromised teeth to support a third crown in between. A three-unit fixed bridge will cost less initially than a dental implant, and there is no healing period. But a major downside is the need to grind down of healthy teeth that would otherwise not need dental work. This can weaken those teeth and make them more susceptible to decay and gum disease. Therefore, bridgework often needs replacement eventually. What to Expect When You’re getting Dental Implants? Making the choice to replace your missing or failing teeth with dental implants is a big step… but in terms of bringing back your healthy smile, it just might be the only challenging one you’ll need to make. Once you’ve decided to go with dental implants, your team of dental professionals will take care of the rest. It’s a smooth progression from initial consultation and preoperative planning through the implant procedure itself, concluding with your follow-up care. When it’s done, you will have the natural-looking smile you’ve dreamed about. Want to know how this all happens? Come see us and Dr. Lee will answer all of your questions! You may be thinking about it, but the first step in your dental implant procedure happens the day you go into the dental office for an introductory consultation. That’s when you will likely have an initial examination and a discussion with Dr. Lee about your expectations and concerns. Although it’s just the beginning, by the time your first meeting is over, a number of details should be clearer. For example: How many of your teeth are missing, how many are in good condition, and how many are questionable? Would you be best off with a full set of upper or lower replacement teeth-or is it only one or two teeth that need replacement? Are your gums in good shape? 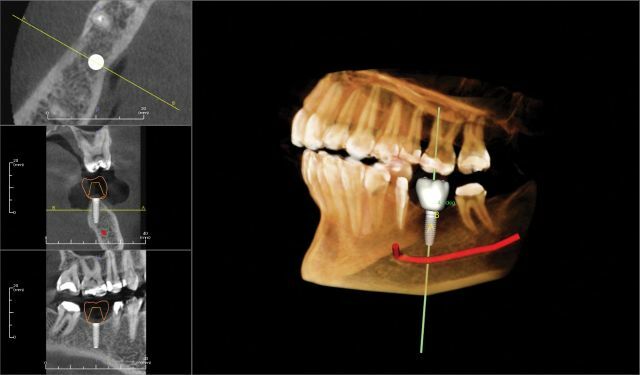 Do you have any medical conditions that would complicate or preclude implant placement? What can you expect to get from this treatment, and approximately how much should it cost? Not all of these questions can be answered immediately, but they can be soon. You will have additional diagnostic images, such as a panoramic x-ray or a 3D CT scan. When the results are available, they will be carefully reviewed (along with your medical history) by Dr. Lee, and a comprehensive treatment plan will be tailored just for you. Just as your builder wouldn’t start building the foundation of your new house without a drawing, Dr. Lee will not place your implants without a treatment plan. Diagnostic images of your mouth can reveal the condition of existing teeth and bone, and show the position of various anatomical structures in the jaw. This helps in terms of planning the number and type of implants to be used, and the locations where they should be placed. Before any procedures are performed, be sure to let Dr. Lee know if dental procedures cause you extreme anxiety, as there are a number of ways to help alleviate it. If you have any other questions or concerns about the procedure, this is the perfect time to raise them. Next, it is on to the big day. When you arrive for your procedure, the clinical team will help make sure you are comfortable and relaxed. You will be given the appropriate anesthesia, and prepared for the procedure. If any of your teeth need to be extracted that may be done first. While it may sound scary, the extraction procedure is relatively quick and painless. 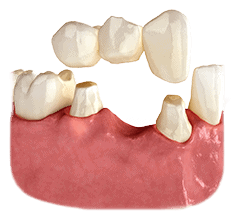 By carefully manipulating the tooth, it can be removed without damage to the surrounding bone or tissue. Now it’s time for the dental implants themselves to be placed in your jaw. This procedure may require small incisions to be made in the gums, providing access to the bone underneath. Next, tiny holes called osteotomies will be prepared at precise locations in your jawbone; usually, a surgical template is used to guide their positioning. You won’t feel any pain during this process because you will be fully anesthetized, but you may experience mild vibration that’s not unlike having a cavity treated. Bone is treated with great care during the procedure. Your dentist will use gentle pressure and plenty of cooling water to protect it. 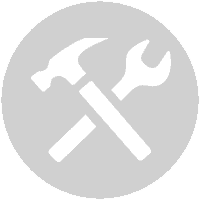 When the osteotomy sites are fully prepared, your implants will be carefully placed and adjusted for a perfect fit. If incisions were made, they will be closed with sutures (stitches). Then another series of x-rays will be taken showing the placement of the implants. After that, you will rest comfortably for a little while, and then go home. When the procedure is over, the healing process begins. For the first couple of days, you will want to go easy on your new implants by eating soft foods and getting some rest. Over the-counter pain medication, like ibuprofen, is usually all that’s needed to control any soreness you may feel. You can return to normal activities within a day or two, but Dr. Lee may recommend a softer diet for a few weeks. As your implants slowly become integrated into your jawbone, we will carefully monitor your progress; for the next few months, you’ll be asked to come in for an examination at regular intervals. For most patients, your gums will have fully healed within three to four months and your implants will be firmly anchored in the jaw. At that point, your new permanent teeth may be attached to your implants. With the same routine care you would give natural teeth, they can be expected to last for the rest of your life. If any of your teeth are missing, the consequences can be profound, both physically and emotionally. Favorite foods become difficult to enjoy (or even to eat at all), and social interactions become more challenging. Yet there are effects of tooth loss that are not immediately obvious-even to those experiencing them. It is important to be aware of these hidden consequences, because they can adversely affect your health in ways that become harder to remedy over time. Plus, knowing what happens to your mouth after teeth are lost can help you decide on the best way to replace them. Bone needs stimulation to maintain its volume and density. In the case of the bone that surrounds and supports your teeth, that stimulation comes from the teeth touching each other in chewing, speech and normal activity, hundreds of times throughout the day. These stresses prompt the bone underneath each tooth to rebuild continually, maintaining bone density. When a tooth is lost, the stimulation it once provided ceases. This causes the supporting bone in the jaw to shrink in a process called resorption. The longer the tooth is missing, the greater the amount of bone loss. 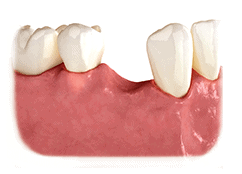 Wearing removable dentures accelerates this process because of the way they press on the bony ridge. Studies have shown that during the first year after tooth loss there is a 25% decrease in width of bone, and, over the next few years, an overall 4-millimeter decrease in height. 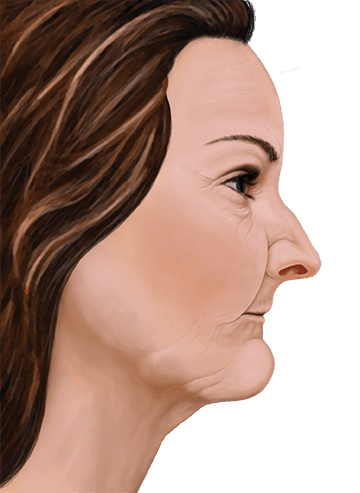 Loss of bone makes a person look much older and can make an individual more prone to jaw fractures. As if all of this wasn’t enough to worry about, there’s the risk of malnutrition. As teeth are lost, it becomes more difficult to eat and chew food effectively. Unfortunately, the healthier foods – raw fruits and vegetables – usually become the most difficult to chew for toothless people. None of these problems need occur when missing teeth are replaced with natural-looking prosthetic teeth supported by dental implants. Besides helping a person without teeth look and feel great again, they can actually help prevent bone loss. No other tooth-replacement option offers this important health benefit. A primary reason to consider dental implants to replace missing teeth, then, is the maintenance of the jawbone. As described earlier, your jawbone needs stimulation to stay healthy. Because implants are made of titanium, bone will attach to them, and maintain bone density. Replacement teeth supported by dental implants do not put pressure on the gums or the surfaces of the bony ridges of your mouth the way that removable dentures do. They also do not compromise adjacent healthy teeth, as standard dental bridges do. In fact, as time goes by, and you continue to enjoy life with great-looking, functional teeth, you’ll hardly think about the fact that you have dental implants. Best of all, they will likely never need to be replaced – your investment will still be paying dividends far into the future. Ask us about how dental implants can change your life.